When I'm opening up a new Meg Rosoff novel I literally never know what to expect. In a good way. She never tells the same story twice. She does generally center her stories around a character who feels ambivalent, anxious, or sometimes downright disenchanted with his or her world. She explores themes both serious and disturbing and her resolutions are bittersweet at best. And yet I love her writing. She's an auto-buy for me and has been ever since I first read How I Live Now and thought I would come apart at the beauty of that book. Readers who love one of her books and long for more of the same with her other books will most likely be disappointed as they are all wildly different tales, the lovely writing being one of the only things they share. But how rare and fine a thing it is to have an author you can always count on but can never quite pin down. Early on the morning of her wedding day, Pell Ridley sneaks out of the home she's lived in all her life, swipes her dowry money from the teapot, saddles her old horse Jack, and heads for Salisbury Fair. Determined not to become her mother--broken and beaten by a dissolute husband, a host of hungry children, and a hard life in general. Pell won't, she can't, stay and marry her childhood friend Birdie. No matter how much he says he loves her, no matter how many family members and friends are depending upon the match taking place. And so she rides away from it all with only the vaguest notion of finding work at the horse trading at Salisbury Fair. What Pell doesn't count on is her little brother Bean coming along for the journey. Bean doesn't talk, never has, but he seems to know Pell and understand her motives. More than that, he seems to have an essential role to play in what happens to her. She also does not count on the remote Dogman, a poacher she encounters first in Salisbury and once more far away from that place. Of course, nothing goes as it should. In fact, everything that can go wrong does and things get progressively worse as Pell desperately tries to maintain a modicum of control over her own life and, at the same time, not lose the one or two things she considers precious. For those poor souls who can only think of the terrible fear and danger of a runaway horse, think of this: a speed like water flowing over stone, a skimming sensation that hovers and dips while the world spins around and the wind drags your skin taut across your bones. You can close your eyes and lose yourself in the rhythm, because nothing you do or shout or wish for will happen until the running makes up its mind to stop. So you hold steady, balancing yourself in the wake, and unhook your mind from the everyday while you wait at the silent center of it all and hope that the feeling won't stop till you're good and ready for life to be ordinary once more. The problem being that she never was. 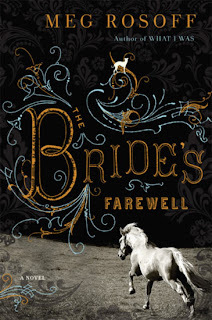 The Bride's Farewell is a smooth, at times extremely painful, read. It's hard to watch one bad thing after another happen to good characters. It's hard when they're forced to pay for their mistakes over and over again. But I've learned that with Rosoff it always pays to follow her through to the end. The dark and the dreary are balanced by the truly beautiful writing, the sharp glints of irony, and by the brief but shining moments of perfect understanding and compassion you feel when you're reading. I've been looking forward to this one, can't wait to get my hands on a copy! I'm glad to hear the love triangle is resolved (in the Mercy novels), I am obviously keeping my fingers crossed for Adam. He is definately one of my fictional crushes! Juju, isn't it? I think it's my second favorite of her covers, after the original one for HOW I LIVE NOW. So striking. Kath, I hope you enjoy it. Rosoff creates some of my favorite child characters. Piper in HOW I LIVE NOW and Bean and Pell's little sisters in this one. They always seem wise beyond their years, in an enchanting way. And, yes, the Briggs wraps up the triangle in a lovely, timely fashion. :) Big Adam fan here! I love the scene in BLOOD BOUND where they're sparring and as Mercy's leaving she looks back and the look on his face...hehehe. Yes, you liked this much better than I did! Amy, I did! I read your review and it doesn't sound like it was the perfect time for it either. I hate it when that happens. But I do seem to have the Rosoff gene because I've loved all four of her books. I CANNOT wait to read this! When you say "...I first read How I Live Now and thought I would come apart at the beauty of that book." I felt the EXACT SAME WAY. Like there are just no words to describe that feeling. Emily, hey! I think you will enjoy it. And there really are no words for it. HOW I LIVE NOW is one of the books of my life.